To start with, we had smoked duck, ham and eggs and tomato broth. 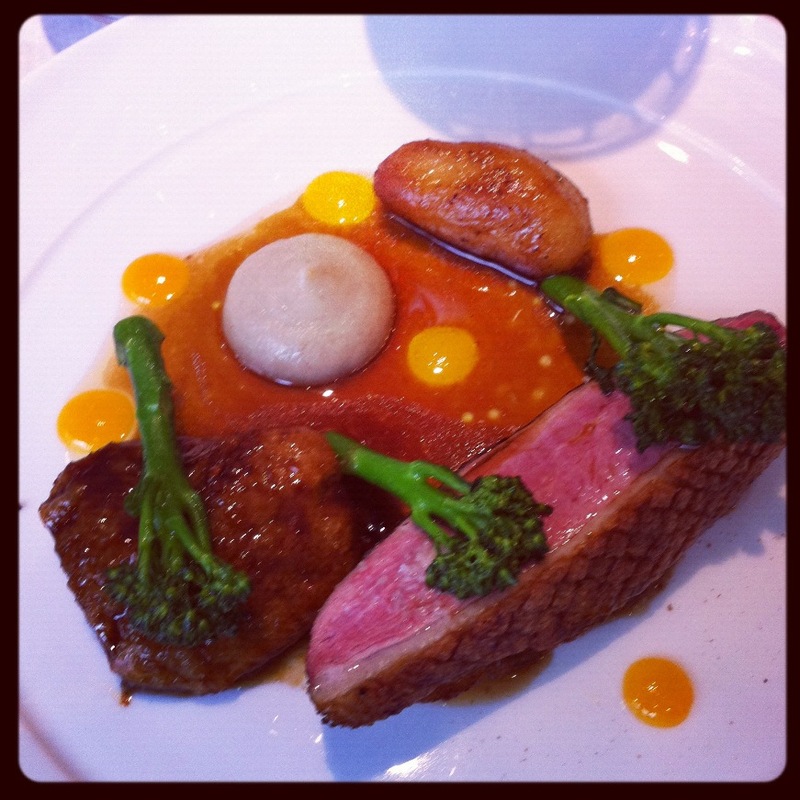 The duck was so-so, five very thinly-sliced pieces didn’t really deserve their £12 price tag. The vegetarian option was the spring vegetable and tomato broth which our friend didn’t particularly rave about. The ham and eggs though, brilliant. Little discs of sweet/salty ham and a Scotch egg with runny yolk and tomato jam. Nom nom. We are in Scotland, so the mains have to involve something of bovine origin. 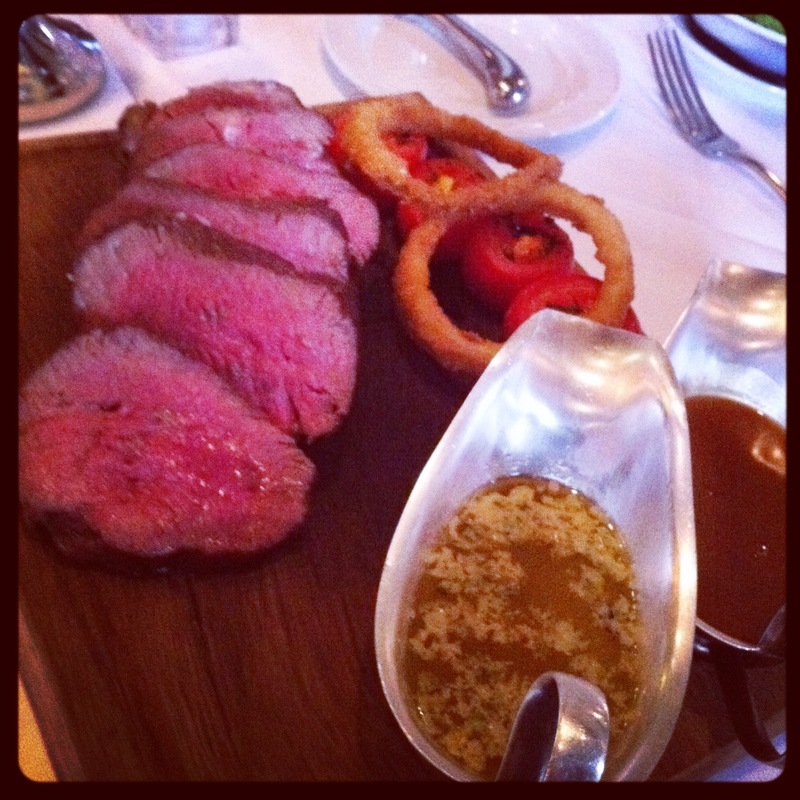 A rib-eye steak, a sirloin steak and a chateaubriand for two. These were served with simply roasted rosemary tomatoes, onion rings and chips. The steaks were thoroughly enjoyed by our friends. The chateaubriand, which is thick-cut beef tenderloin, was beautiful. Really, it was. Cooked medium-rare, this was better than anything we’ve had inLondon, even in the famed steak houses. ‘Nuff said. While all the food weren’t earth-shattering, the total experience had been and (hopefully) will always be great. Friendly staff members and impeccable service. 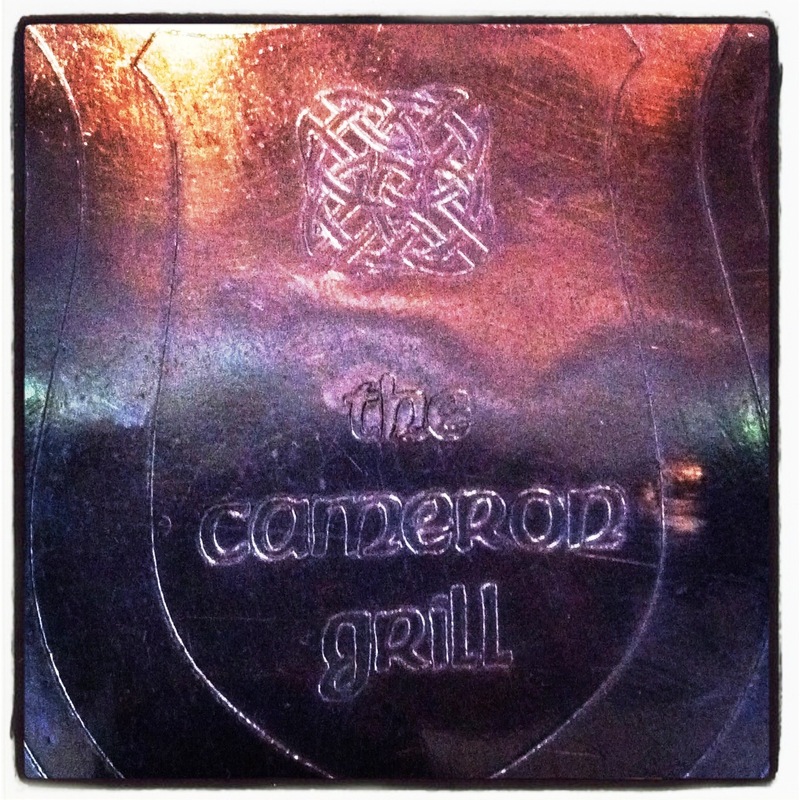 And the best part is, the Cameron Grill delivered what was expected: excellent quality beef. Pollen Street Social is the new home of Jason Atherton, the celebrated former head chef of Maze. The venue aims to cater for those looking for a three-course meal or a drink and light nibbles in the bar area [or three-course lunch followed by a drinks in the bar in our case]. The décor is relatively neutral and simple yet effective, with wooden floors, white walls adorned with a variety of modern artwork and dark brown leather furniture. The use lighting really adds to the overall modern feel with multiple large glass light fittings and a collection of these at varying heights over the bar area. We were a party of four friends booked in for a good catch-up over a 1pm Saturday lunch time table. We were seated at the far end of the dining room by the window. Aperitifs were promptly ordered as we perusde the menu. Bread arrived shortly afterwards along with an amuse bouche of salted cod and olives. Good start. There was a choice of either a set menu or a la carte; I think we all got seduced by the a la carte menu in the end although the set menu also featured some great dishes. Food decisions finally made and ordered and with guidance from a very helpful Sommelier on wine choices, we were all set to lunch! Amongst others, our starters consisted of the All Day Breakfast and deer tartare. G: The All Day Breakfast certainly didn’t disappoint. A perfectly runny poached egg sat on a deep tomato ragu served with sautéed mushrooms, bacon strips and croutons. This dish was a much a feast for the eyes as it was for the taste buds, excellently executed, and it really raised the bar for the courses to follow. B: The fallow deer was served with slivers of toasted bread, pickled beetroot, salted sesame and pumpkin seeds and a broken egg sauce. As a fan of rare meat, all I can say is I enjoyed it very much. The pickle replaced the typical caper accompaniment and presented a good contrast to the richness of the egg sauce and the meat. G: My main course consisted of lamb with creamed spiced aubergine, Jerusalem artichoke and a black olive reduction. The lamb was perfectly cooked, tender and pink. My plate was squeaky clean at the end of it. ‘Nuff said. (Of course, bone on the side LOL). 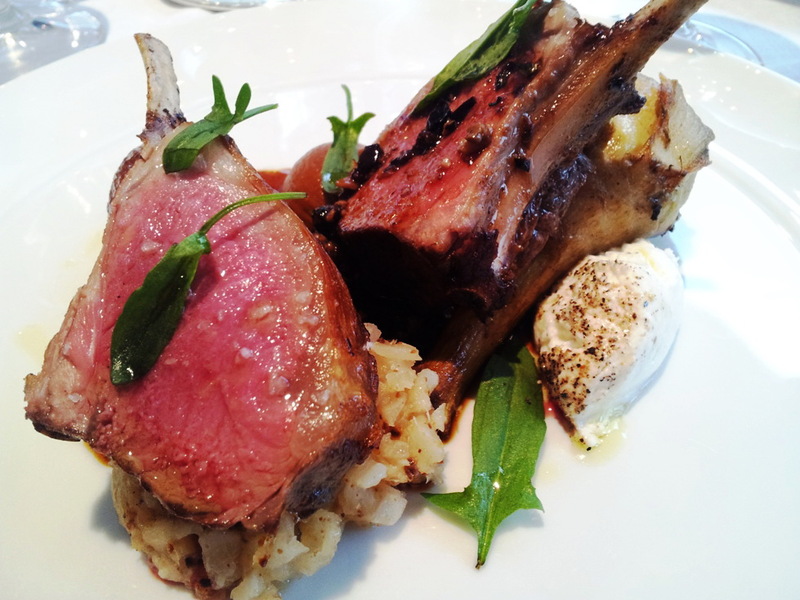 B: I had slight food envy looking at the pretty lamb served right across me! Thankfully, the jealous feelings were quelled when the duck was laid in front of me. Certainly not an ugly duckling. 😀 Served with Jerusalem artichoke and braised duck leg, the pink meat (and skin) was rich, and the clementine and mandarin conserve served its purpose well. 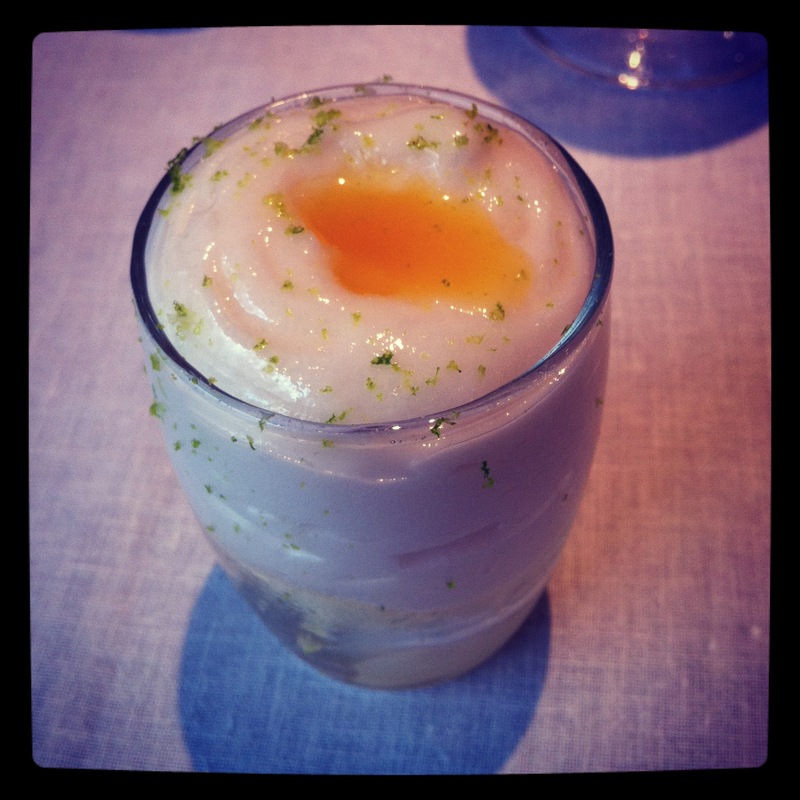 Before our official desserts arrived we were brought a lovely refreshing pre-dessert in the form of lychee granita, topped with lime foam, passionfruit coulis (or something) and lime zest. G: It was so good I ate mine and another of my friend’s. G: Of party of four, two of us opted for the same dessert, the apple caramel puff. It was a close call between this and the tiramisu, but after consultation with our very helpful waiter the apple caramel puff won by a whisker. The dish comprised of a chunk of caramelised apple with some strategically and artfully arranged puff pastry sticks. This was topped off with a calvados cream. The apple was full for flavour with just the right mix of texture so was soft but still with some bite to it. The calvados cream added a subtle hint of alcohol which wasn’t too over-powering and really complemented the sweetness of the caramel apple. The puff pastry also added some texture. 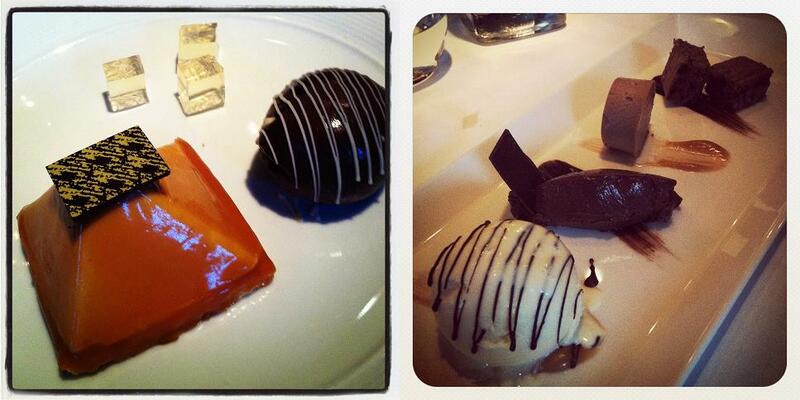 As a bit of a dessert addict this isn’t the type of dish I would ordinarily order but I was very pleasantly surprised. Just when we didn’t think we could eat any more along came a little wooden chest with our coffees which contained mini macarons, chocolate-covered coffee beans, mini cakes and chocolate praline bites, all of which were an absolute delight. In fact, we actually requested additional macarons which they gladly provided with no fuss or additional charge. Brownie points (ding ding!!). 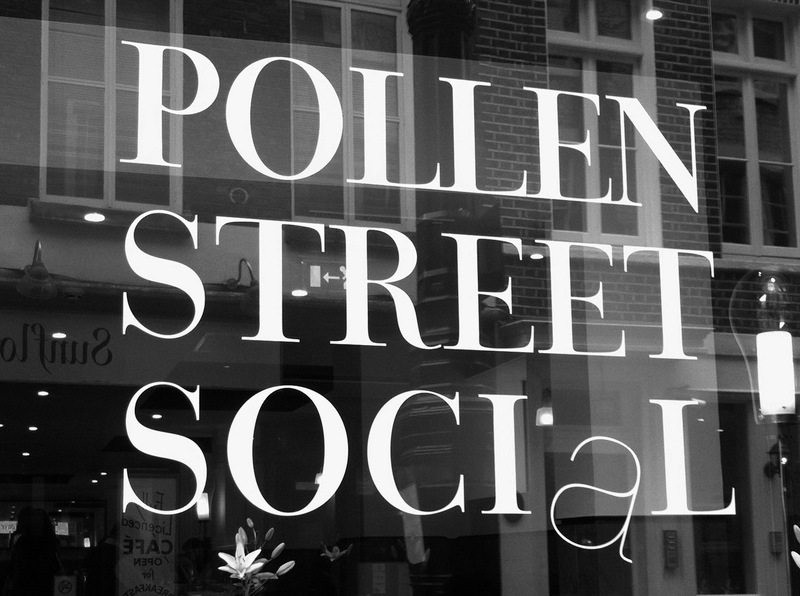 Overall Pollen Street Social is certainly up there as one of the best dining experiences we have had in London. Not only was the quality of the food exceptional, the service was also friendly and professional, we actually grew quite fond of our waiter towards the end of our epic 4-hour lunch. He answered our many menu queries, demonstrating a real knowledge of the food, being served. Even when they needed our table back to prepare for the dinner service, they helpfully re-located us to the bar. The bill came to £400+ which is excellent value for four of us having a three-course lunch, bubbles and drinks, two bottles of wine and coffees. We would certainly recommend Pollen Street Social to anyone looking to indulge themselves in a quality and memorable dining experience. If you live in the Brixton / Clapham area, appreciate good food and haven’t been to Upstairs, you are definitely missing out. 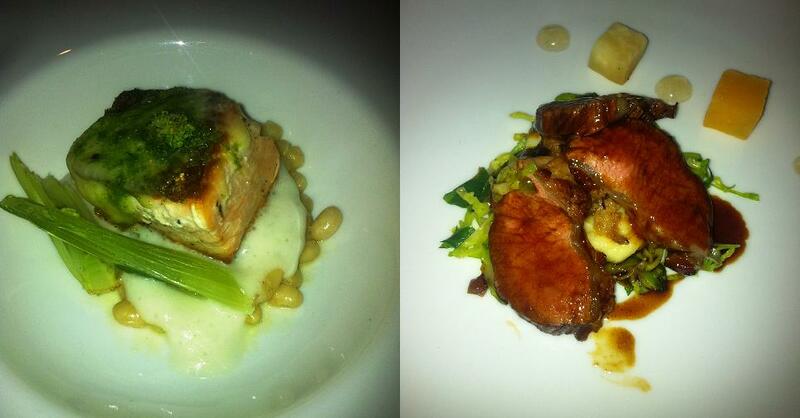 In fact, regardless of where you live in London, dinner at Upstairs is well worth the trip. This was our third time dining at this secluded little eatery: located above Opus coffee shop on Acre Lane, the entrance is discreet doorway on Branksome Road. On the first floor lies a relaxing bar area [which doubles as an additional dining room on busier nights] and a second flight of stairs takes you to the main dining room. Intimate is probably the best description of both the size and ambiance. There must be approximately 12 tables neatly packed in but not so close that you spend your evening listening to the neighbouring table’s conversation. One of the many things we really like about Upstairs is the simplicity of the menu which offers a choice of only three starters, mains and desserts. Some people would regard this as limited but if anything, it makes your choices more difficult as everything sounds so damn good and you really can’t go wrong whatever you pick. Also, with this menu format, you invariably end up eating something you wouldn’t normally choose – great for expanding the culinary experience! At the time of writing, Upstairs was offering a tasting menu throughout January & February which consisted of smaller portions of 2 out the 3 dishes for each course. We figured the opportunity to sample 66% of the entire menu was too good an opportunity to let pass. Drinks in hand, we settled into the starters. We must add that Upstairs offer a great selection of aperitifs [£8.50 each] the Prosecco and Peach Liquor cocktail being a particular favourite. [The Frangelico drink is dangerous, it crippled me once – cost me a day! haha]. The amuse bouche was smoked mackerel, a rather pleasant surprise. The starters were parsley root soup and confit of rabbit. The soup was thick, smooth and hearty, served with shavings of truffle and walnut royale. The truffle lent it an earthy taste, and was fit for the cold winter night. The rabbit was served with pieces of heritage carrots with rhubarb. Again, excellent. 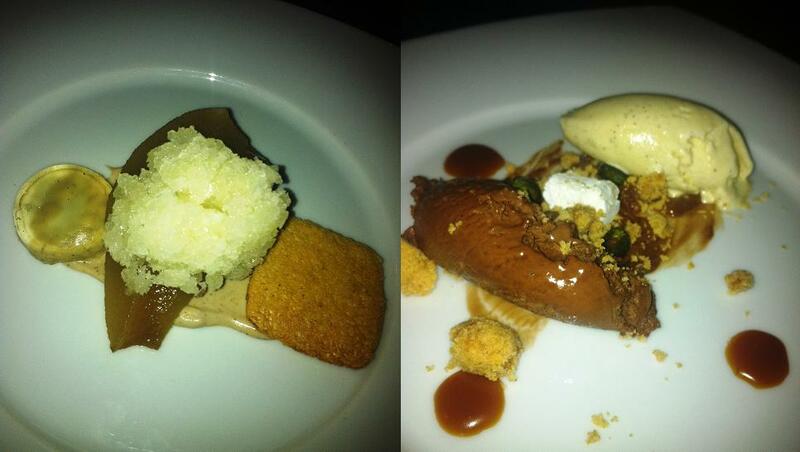 Desserts were poached pear and chocolate mudslide. The pear was poached in star anise and topped with amaretto granita. The white wine jelly and the olive oil biscuit added depth to the dessert when gently wolfed down together. The chocolate mudslide was a revelation. It was light, paired with vanilla ice cream, marshmallow, crumble and pumpkin seeds. The salted caramel sauce is a treat on its own. (I wish there were more of it though, but that’s just me. – Baz). A great way to end the meal, indeed. All in all, a trip to Upstairs never disappoints. The food is consistently great, the restaurant itself has a real charming quality about it, and husband & wife team Philippe and Stephanie are friendly and attentive as front of house.